Bruce Donald summarises a number of cases of "Defamation Against Public Interest Debate"
This website is authorised by Greg Ogle on behalf of Bush Lawyers Ink, a not for profit legal service brought to you by the legal system's inability to protect the community's right and ability to participate in public debate and protest. It is an old joke from a testosterone approach to the law that you should use legal threats to wallpaper the toilet. But frankly, when it comes to applying the law to political disputes, wallpapering the loo may be a useful response to many legal threats. They certainly should not be heeded as a reason to stop genuine acts of public participation. To help people with their wallpapering, the following are copies of various lawyers letters which threaten legal action or which otherwise have a chilling effect on free speech and the community's ability to participate in public debate and protest action. Of course the lawyers were only acting on instructions from their clients so they are not responsible, and the Bush Lawyer would never suggest that there was any wrong intention in making the threats. You can be the judge of the merits of the letters and the claims made in them. Please send copies of any legal threats you have received to greg_ogle@yahoo.com so they can be add to the wallpaper. These letters also provide the source information for the definitive list of Australia SLAPPs. 1991: Tas Pesticides: Threat over Toxics Action Network media statements about chemical spraying in Tasmania. 1993: APPM: threat to The Wilderness Society over proposed protests at Tasmanian paper mill. No litigation ensued. 1994: TAPG: Tasmanian Agricultural Productivity Group threatened a local environment group over its media statements. 1994: Hindmarsh Island Bridge: developers threatened 35 local people with massive damages over delays to the bridge process. No litigation ensued. 1995: CFMEU: A media threat by the Forestry Union against The Wilderness Society over comments in relation to forest logging disputes and the union's reputation. Union secretary Michael O'Connor later sued the spokesperson for defamation. 1996: Democrat Senator Robert Bell threatened The Wilderness Society over comments the Society made about the Senator's attitude to protection of certain wilderness forests in Tasmania. Advertisements complained of proceeded; no litigation ensued. 1997: NAFI: The National Association of Forest Industries threatened TV Channel 10 over their airing of a community service announcement by The Wilderness Society. 1998: Hindmarsh Island Bridge: developers threatened the Kumarangk Legal Defence Fund over alleged defamations on the KLDF website about other law suits brought by the developers. No legal action followed, despite another threat. 2000: Hindmarsh Island Bridge: complaint about alleged defamatory and sub judice content in an article in Indigenous Law Bulletin. Authors response is also attached. No litigation followed. 2002: SA State Election: Liberal Minister Wayne Matthew threatened The Wilderness Society over its Vote Environment website. 2002: Hindmarsh Island Bridge: developers demanded removal of website material and an apology from the Australian Library and Information Association. 2003: Victorian Farmers Federation: threatened Animal Liberation SA over alleged disruption of live sheep exports. Action was later taken in the Federal Court. 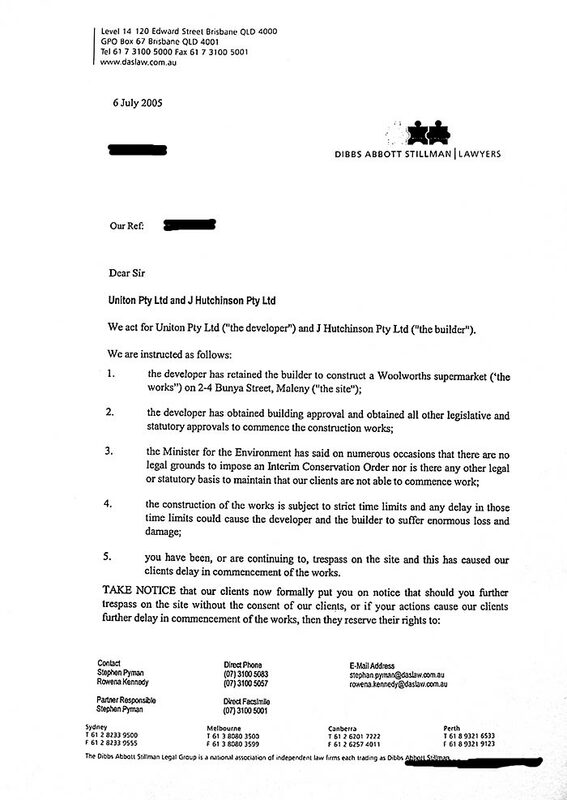 2003: Hardie's Paxton Development: Property developer threatened The Wilderness Society over comments on its website about the development's impact on wetlands. The TWS response points out is instructive. No litigation ensued. 2005: NSW Forests: a senior NSW government bureaucrat threatened The Wilderness Society over a letter sent to her asking her to comment on allegations about her behaviour and that of her department. The initial letter expressly forbade publication, but the final threat letter is uploaded here. No litigation ensued. 2005: Maleny Supermarket: a supermarket developer threatened local residents who opposed the development on environmental and lifestyle reasons. A follow-up threat was made, but no litigation ensued. 2005: Computer Report Card: Computer giant Toshiba threatened Environment Victoria over its unfavourable report on the environmental aspects Toshiba's computers. EV acknowledged mistakes and issued a retraction, but the bush lawyer's question is why did Toshiba go straight to the heavy-handed lawyering instead of approaching EV directly. 2005: Whyalla Red Dust: One Steel Manufacturing threatened a Greens candidate and solicitor acting for a community group for media comments on the public health impacts of red dust. They also "reprimanded" another solicitor for similar comments - though why lawyers had to write this letter was unclear. 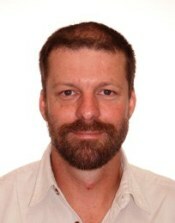 2006: Reef Cove Resort: The resort developer's lawyer threatened local activist Steven Nowakowski over a series of trespasses in protest against another north Queensland development.